Thank the Hipsters ← You Want Me To Wear What? I loved the 90s. Granted, I was 5 when they started, so I don’t remember much, but I do remember wanting a pair of Doc Martins because Clarissa wore them. I also wore flannel shirts until ’97. Hey, I never said I knew how to dress. But as I was saying, I love the 90s. I was born in ’85, and I can easily say that the 90s rank as one of my top 3 favorite decades to have lived through. This will never, ever be okay. I can’t begin to verbalize why it’s so awful, beyond stating basic observable facts about the skirt. All I can do is repeat, over and over again, “It’s buffalo check! It’s tiered! It’s tiered buffalo check! TIERS. BUFFALO CHECK. THIS IS NOT OKAY.” Then I wave my arms wildly at the screen and make noises, because somehow that will better convey my distress. I know someone will buy this. They will probably wear it with those stupid bootie-heel shoes that make it look like what Peter Pan would wear to the Neverland Cross Dresser’s Ball. They’ll wear it with a leotard, and they will look down at me disdainfully in my jeans and Chucks (I told you I don’t know how to dress). 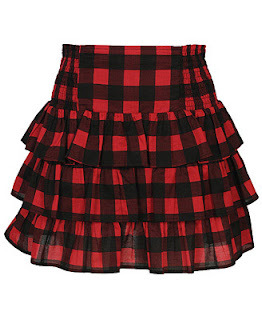 But that will not change the fact that they are wearing A TIERED BUFFALO CHECK SKIRT. And that is not okay.